I swear this packaging is responsible for whole generations thinking tea originates from India. Of course, in a sense it does. After all, the British have been importing tea from India for centuries. It's just that we stole all the plants we needed from China first. The story of how tea arrived in India from China is a fascinating story and, if you're even remotely interested, I would wholeheartedly recommend the light but informative romp that is For All The Tea in China by Sarah Rose. In essence though, the British were importing tonnes and tonnes of tea from China but the trade was increasingly one way: the British didn't have anything to sell that the Chinese wanted to buy. Therefore, a plucky Brit made it his mission to sneak into China, to which tea is indigenous, and steal plants which we could plant in India's comparable climate. Not having enough to trade with the Chinese later led to the Opium Wars, resulting in the ceding to several ports to Britain, including Hong Kong. So what better way to rediscover tea (and try my best not to contemplate too deeply Britain's rapacious, colonialist past) than to 'take it' (one does 'take' tea yes?) in the tea house in the centre of Nan Lian Garden, right in the centre of Hong Kong. Located to the North East of the very built up peninsula of Kowloon, Nan Lian Garden is an oasis of calm in the middle of one of the most densely populated conurbations on Earth. It's attached to the Chi Lin Nunnery, which is a sight worth seeing in its own right. Built in the 1930s and then rebuilt in 1998 as a replica of a nunnery from the Tang Dynasty (618-907CE in the Western calendar), Chi Lun is dwarfed by the modern skyscrapers on most sides. And yet, compared with the bustle of most of the rest of Kowloon, it can be a welcome escape. Hong Kong is one of my favourite places in the world, but if you're finding it a little too intense, get thee to the nunnery! Once you've had your fill of relaxing lotus ponds, bonsai and chanting nuns (and taken enough shots juxtaposing the nunnery with its skyscraper backdrop), head onward into the adjoining Nan Lian Garden. A golden pagoda, ponds replete with koi and some frankly bizarre rocks await. Oh, and a surprising degree of serenity too. Even though admission is entirely FREE and the complex is only a short Metro ride away from the bustle, we found the Garden pleasingly unpopulous (we went in late March). That means you can take your time meandering (or following the complimentary map, if you're as allergic to just 'going with the flow' as I am). When you have achieved inner peace (or you start getting a bit thirsty, whichever comes first), cross the bridge to the tea house, located on the island in the middle of the pond. Inside, you will be greeted with a sleek wood interior. You'll be asked to remove your shoes to slip into something more comfortable (slippers of course). Having been shown to your table you will be presented by a list that might seem bewildering. For someone who, at the time, thought Typhoo was a shockingly different twist on the standard PG Tips, the sheer choice was initially overwhelming. And the simple descriptions didn't help particularly. But there's never cause for alarm in these situations. I just fell back on my standard operating procedure and asked the expert. Our waiter recommended teas we might like based on the flavours we enjoyed. Soon they arrived and he demonstrated how to make a proper cup of tea. - Heat the water (not quite boiling it, around 85 degrees was right for the teas we had chosen). - Pour the hot water into the small tea pot containing the tea leaves with strainer. - Heat the cup with some of the water. - Pour out a little of the tea and discard it (anything untoward riding along with the tea leaves will also be discarded by doing this). - Pour the tea into the small cup. - Slurp it (no really - this is the scientifically-proven best way to taste tea). - Never drink tea the way you used to EVER AGAIN. In all seriousness, I've never looked back. I can't remember the last time I had a cup of 'normal tea' (English Breakfast Tea) with milk and (heresy!) sugar. It's fair to say Antony and I are something of tea aficionados now. And it all started at Nan Lian Garden, close to the indigenous home of tea (well, closer than India anyway). Yesterday, Antony sent me a screenshot of his desk calendar at work featuring '1.000 places to see before you die'. 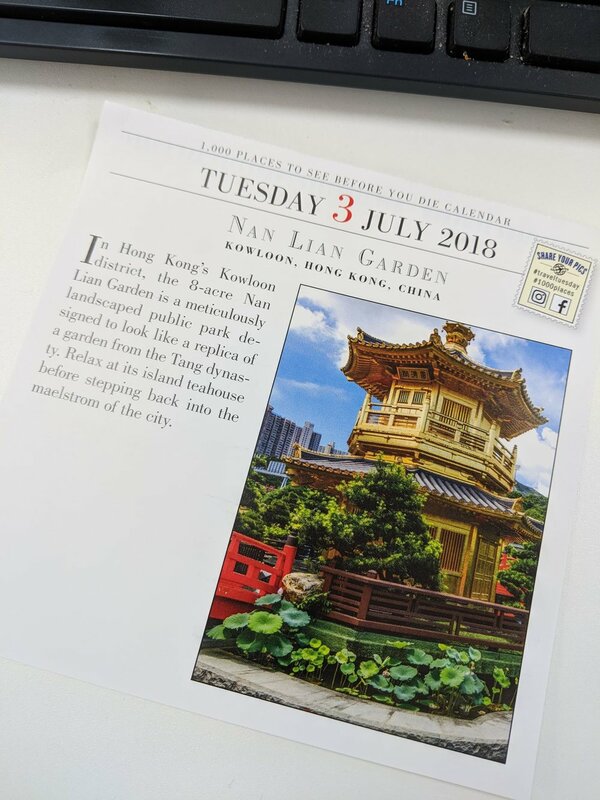 The tea house only gets a quick mention in the entry for Nan Lian Garden, and the picture is of the golden pagoda, but just seeing this screenshot was enough to stop me in my tracks. As it happens, I was making a drink at the time. I put down the jar of coffee, let the recently-boiled kettle cool for a couple of minutes and reached for the tin of tea instead.